OS can be selected from “Windows-OS” and “BHT-OS”! Proprietary power-saving design allowing a 28-hour* consecutive operation, the longest in its class. 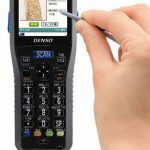 * When ratios of reading, wireless communication, rewriting of screen, and holding durations are 1:1:1:20 in continuous wireless operation; when a standard battery is mounted in barcode models. · Smooth 360° reading is realized using the latest algorithms. 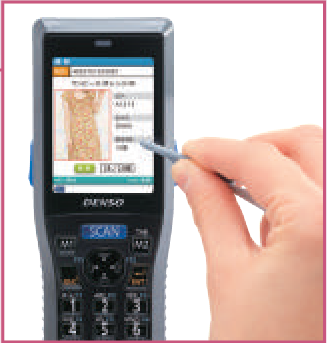 · Compared to barcode models, working time with the model can be reduced up to 30%. 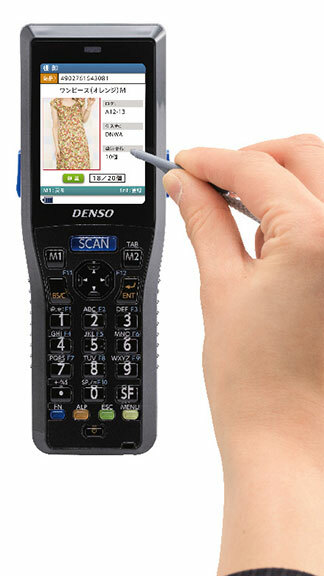 · A convenient touch panel allows intuitive operation. 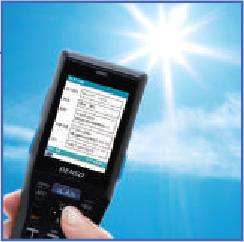 · A high-visibility LCD, High-Bright Display, is used. · A wide viewing angle, and therefore, enhanced visibility from oblique angles is realized. · Design was sought for functional beauty that also allows comfortable operation despite size constraints. 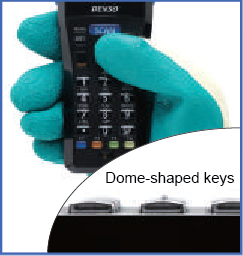 · Dome-shaped keys are used, which can be operated easily by workers wearing work gloves. 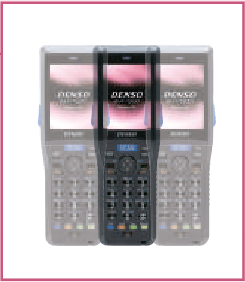 * Compared to Denso Wave’s BHT-800Q when a thin battery is mounted in respective 2D code models. Operation time longer than Windows-OS model. 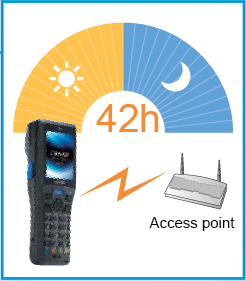 · Unique power-saving design enables best-in-class long-time operation of 42 hours* even when continuously connected by wireless. * Ratio of scanning: wireless communication: screen update: standby = 1:1:1:20 under continuous wireless WAN connection. 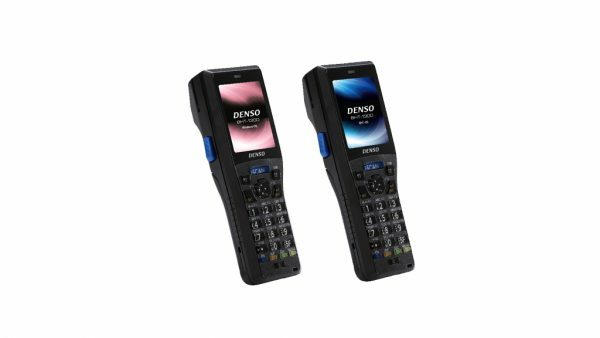 For barcode model with a standard battery. 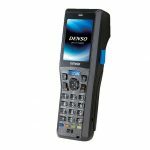 High-performance hardware enables comfortable operation. · High-speed CPU and large-capacity memory enable fast and efficient processing. Ready for use with simple business application software. 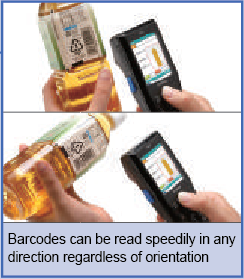 · A simple business application software (Easy Pack Ad) allowing collection of actual records for inventory and inspection plus 1:1/1:n collation is included as standard equipment. 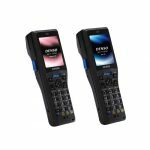 · No other devices are required for data transmission. 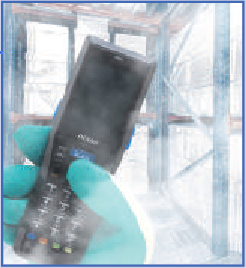 · Even in the case of sudden loss of battery power, commercially-available dry-cell batteries can be used. * A dry-cell adapter is separately required. · Newly incorporated “remote desktop plug-in” and “web browser plug-in” enable thin client implementation with lower development costs. · Copies of another terminal can be made quickly. · Each terminal can be set up wirelessly without using a PC. · For Windows-OS model, data on terminals can be backed up with BHT Backup. 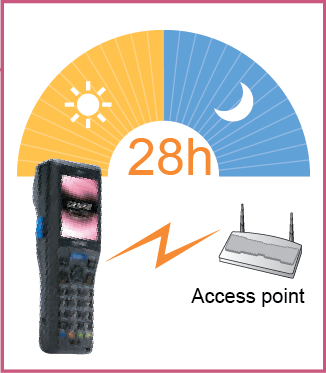 · For BHT-OS model, its transaction function automaticall restores the immediately previous conditions in the case where the battery is disconnected and a file error occurs. · Equipped with a development tool to help develop all kinds of applications. 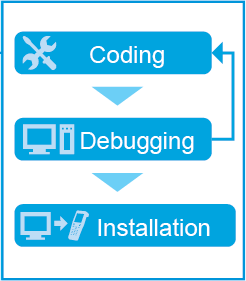 Coding, debugging and installation can be efficiently controlled. · Highly compatible, unique OS enables effective use of application assets. · The model can be used in more than 40 countries worldwide. · Supports multi-language display. For Windows-OS, fonts for more than 40 countries are supported. For BHT-OS model, Japanese, English, Chinese, Korean and Thai fonts are supported. long use with peace of mind. 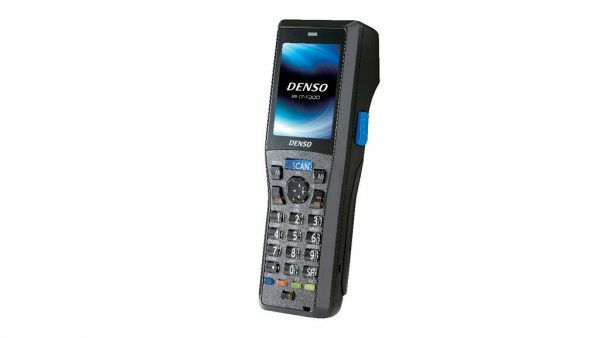 · Customers who register on Denso Wave’s website are offered a 3-year warranty. 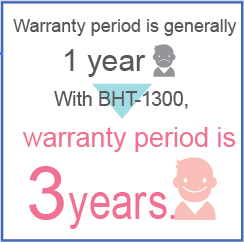 * 1-year warranty for consumables as defined by DENSO WAVE. · Easy to use around the world, with a versatile OS. 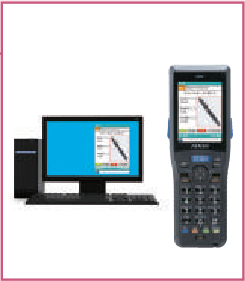 Solid middleware suited to customers’ uses. 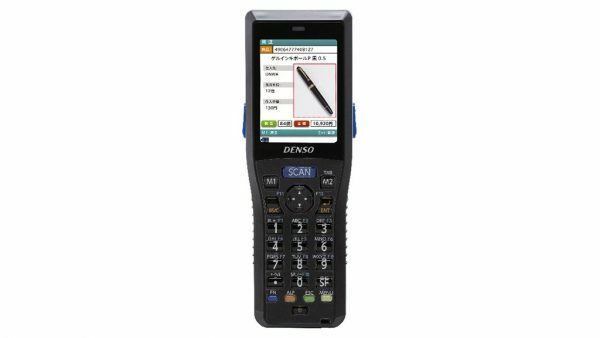 · Various software applications are prepared in cooperation with partner companies across Japan. We introduce software applications best suited to the industry and implementation for each customer. · Copies of another terminal can be made easily. 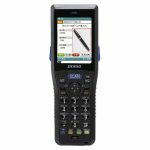 · BHT-OS model is as user-friendly as previous models, yet enables cloning with IrDA.